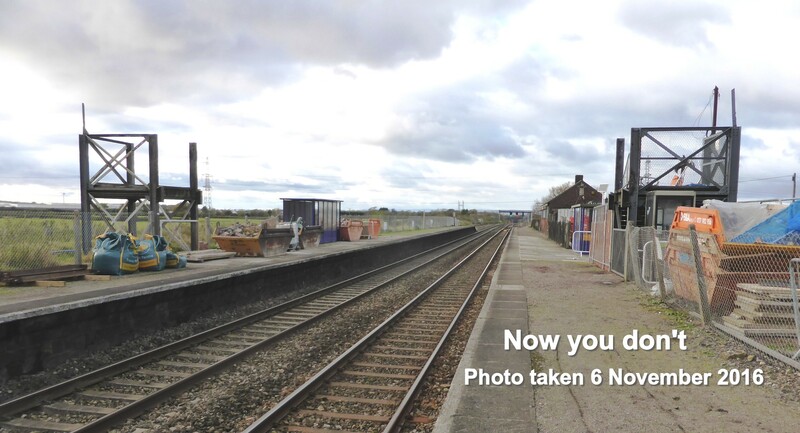 Pilning is an unstaffed single platform station situated on the South Wales main line between Cardiff and Bristol. Long neglected by the railway authorities, it has no service at all on Mondays to Fridays or on Sundays, and has just two trains on Saturdays. 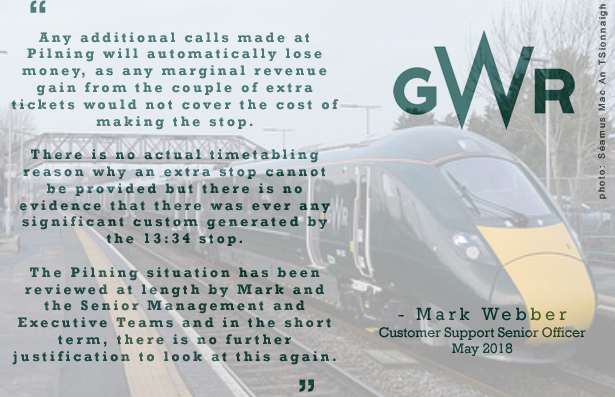 Unsurprisingly, with such a poor service, by 2015/16 it had sunk to the level of "3rd least-used station in the country" with just 46 entries and exits recorded. 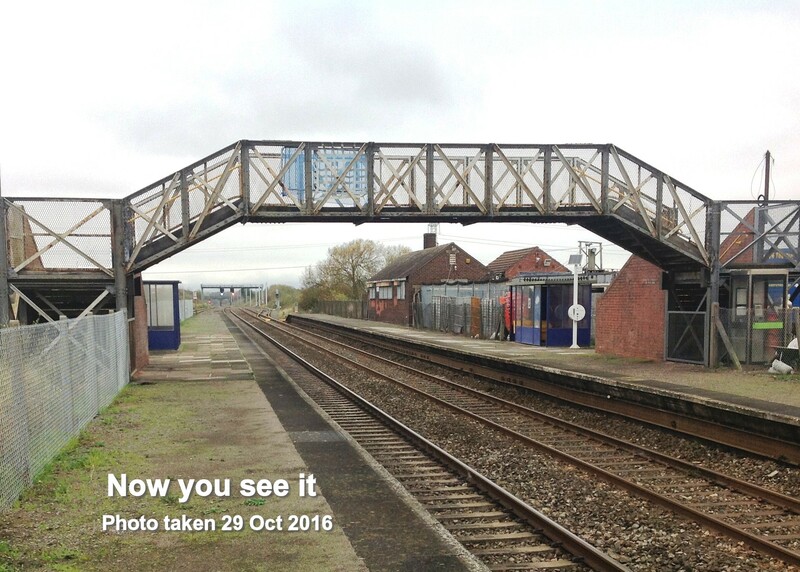 A further blow came in November 2016, when its footbridge was removed to provide clearance for the installation of the overhead electric power supply for new trains. The westbound platform subsequently closed, thus limiting our travel to only two Saturday trains, both in the same direction towards Bristol - one at 08:33, the other at 13:34 (amended to 15:34 from 6 January 2018). To get back from Bristol, you have to go through Pilning non-stop to Severn Tunnel Junction, change trains there (after a three quarters of an hour's wait) and come back again. However, it needn't be like this. As a result of the publicity surrounding the footbridge demolition, usage shot up fivefold for the period 2016/17, lifting the station's dubious 3rd-from-bottom rating up 17 places. In December 2018 Office of Rail and Road revealed the latest figures, and - surprise, surprise! - Pilning Station has outdone itself by going further up in the charts with 478 passengers, more than doubling the previous year's record! Even minor improvements in service would make the station more attractive to potential users - a later Saturday afternoon train would give people more time in Bristol, whilst a Saturday lunchtime train would enable visitors and rail enthusiasts to visit Pilning for a drink and a pub lunch at the nearby Plough Inn and catch the later train back. An early-morning Monday-Friday train to Bristol would give people a fast route to work or college, as an alternative to the slow and circuitous Severn Beach branch which is very crowded in the mornings. Restoration of platform lighting (removed about 30 years ago as it was allegedly life-expired) would enable trains to call again after dark. A significant increase in usage would add strength to any future requests for more regular services, enhanced station facilities, and ultimately the reinstatement of the footbridge and of Platform 2. Every purchased ticket matters. Please support us! However, these are all minor tweaks, desirable though they may be in terms of keeping the station alive and modestly increasing its usage in the immediate future. 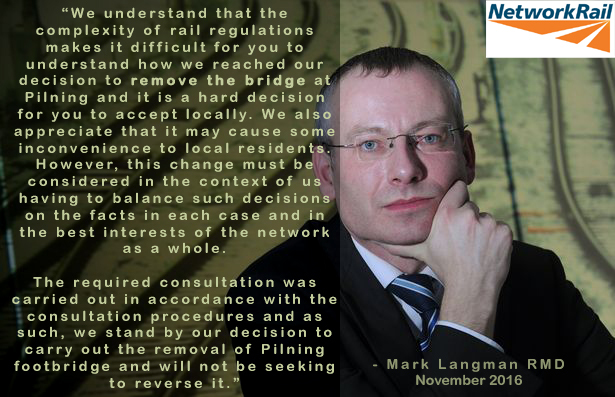 They won’t in themselves bring about a step change to persuade the railway to do what REALLY matters – namely to reinstate the footbridge and the westbound platform, and restore a full all-day, all week service. What about the longer term and the bigger picture? A new junction on the M49 (https://highwaysengland.co.uk/projects/m49-avonmouth-junction), which could be linked up to a redeveloped Pilning station transformed into a park-and-ride facility. There is plenty of room on the south side of the line to build a two- or three-storey modular car park, such as those constructed at Tring, Beaconsfield, High Wycombe and numerous other locations. 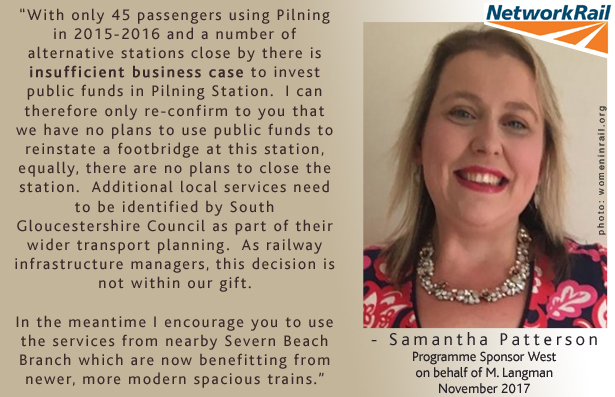 A fully-equipped, fully-functional Pilning station would also bring great benefits to the local community. Even in the 1960s, contemporary accounts described the station’s car park and approach roads as being lined with commuters’ parked cars – that could so easily happen again. You can get by train from Pilning to Bristol in under 20 minutes – half the time that it takes from Severn Beach, which has no car park. You could also get direct from Pilning to Newport, Cardiff and other destinations in South Wales – not feasible from Severn Beach – and change at Filton Abbey Wood for stations to the Midlands and the North. And let us not forget the station’s direct link to Weston-Super-Mare, Taunton, Devon and Cornwall. Pilning station is a potential major transport resource for the local community and the surrounding area. It is currently wasting away, criminally neglected and rendered virtually unusable by years of lack of maintenance and negative thinking. With imagination, forward planning and sensible investment it could be so very much more!